Bizarro is talked into believing that he's "King of the World", and after searching for Regime Superman's voice, he locates him as they both seek to dispatch Solomon Grundy. Story - 3: The match-up that's being teased here overrides most of the usual missteps, for instance, Regime Superman not being able to tell that Lex Luthor was lying. Even if Luthor was somehow able to regulate his heart rate, there are several other signs of someone lying available to a being with Regime's abilities. It wouldn't matter, but once we're shown that Luthor breaks a sweat, involuntarily, which means all of the other bio-chemical signs were there. The simplest thing is to not have the scene at all, but as it's hard to believe that anyone else has the capability, at this point in the storyline, to clone Regime, then Luthor should be easy to suss out. Thankfully, we can always count on Regime to be just foolish enough to allow the story to catch up with the video game. As for Bizarro listening for Regime's voice, why not just go to the Hall of Justice? There's a better than average chance you'll find Regime Superman there, sitting on his throne no less. Bizarro vs Superman battles are usually a light affair in the canon comics, but Injustice can deliver a bout unlike any I've seen before: a boisterous battle between a Superman wrongly formed and a Superman gone wrong. The last time there was a match-up close this was when Val-Zod confronted Brutaal. While Brutaal was shown to be the epitome of what an evil Superman could be, worse than the Plutonian in terms of carnage and destruction, the ensuing match between Brutaal and Val-Zod was settled on an allegorical level, not a two-fisted, red-blooded one. Bizarro against Superman, done in the bombastic manner of most Injustice battles, could be the shot in the arm Year Five needs.. if Buccellato can channel the best of Year One and Two. It shouldn't be hard to do, just let the two of them wreck shop, forget that Wonder Woman actually broke Superman's arm, and remember Regime Superman has to remain alive no matter what direction the story may take. Art - 4: The true outfit puts the others to shame. 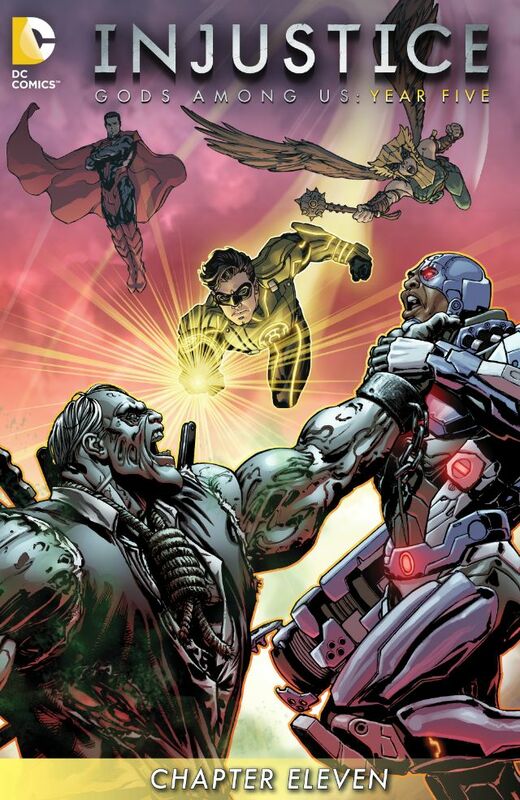 Cover Art - 3: Isn't Solomon Grundy supposed to be a Batman villain?